General Hospital (GH) spoilers tease that Brad (Parry Shen) will be stuck in another jam. He was certainly spooked when he got updates on “Wiley’s” hereditary heart condition. There’s no cause for alarm just yet, but Lucas (Ryan Carnes) is wondering what else the birth mom hid from them. He’s thinking they’ve been left out of the loop on some crucial health shockers. Of course, GH fans know that’s not the birth mother’s fault. She still believes Brad and Lucas are raising her son, but they’re actually raising Michael’s (Chad Duell) boy. That’s the reason for this genetic heart condition, which both AJ (Sean Kanan) and his son Michael had. General Hospital spoilers say Brad’s fears will grow in the week ahead. He’ll fear that this could be what finally makes Michael connect the dots. Brad will naturally have concerns about Lucas digging around as well. If the birth mom is contacted, it could bring some bombshells. Brad doesn’t want anyone looking through medical records and finding out there’s no way this heart condition was passed down. Nevertheless, that’s a possibility he’ll have to face. As Brad’s worries intensify, he’ll turn to the only person he can trust at the moment. That happens to be Julian (William deVry), who’s in on part of this secret. General Hospital spoilers say Brad will have a bit of a breakdown. He’ll feel like the walls are closing in, so he’ll push Julian to do something – and fast. Brad doesn’t know what Julian did to fix the custody situation, but he’s glad it paid off. Lucas and Brad are now “Wiley’s” legal parents, so Julian can clearly get stuff done. Brad will urge Julian to pull another shady move if he has to. He’ll be desperate to keep the baby swap secret from getting out. Julian will surprise Brad by suggesting they do nothing at all. He’ll think anything they try would just raise suspicions and make matters worse. That won’t be what Brad wants to hear. He’ll probably keep encouraging Julian to take action. Brad might want Julian to doctor the medical records. They could make it look like “Wiley” inherited the condition from one of his presumed biological parents. General Hospital spoilers say Julian will battle frustration as this whole plot snowballs. He’ll sense that they’re playing with fire and could easily get burned. Will Julian cave in and help Brad out with this task? Will he stand his ground and insist on letting it ride instead? Either way, Brad will be on edge. Michael’s bound to start getting suspicious down the road, so don’t miss the exploding tension. We’ll keep you posted as other GH news comes in. 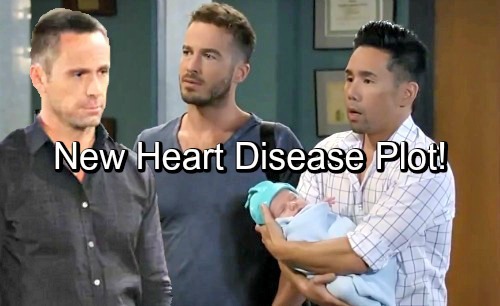 Stick with the ABC soap and don’t forget to check CDL often for the latest General Hospital spoilers, updates and news.